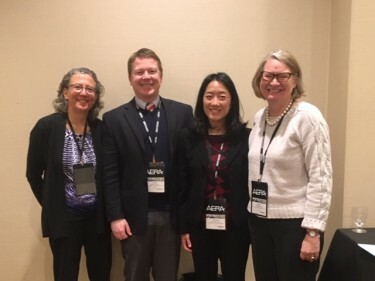 CCRI researchers enjoyed presenting research on high performing transfer partnerships and faculty as change agents at the American Education Research Association (AERA) Annual Meeting in April. It is great to engage and learn from our colleagues at these events – especially those who show up ready to ask questions at 8 a.m. sessions! 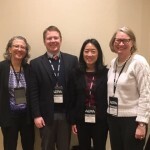 Below is an overview of the presentations CCRI researchers Debra Bragg, Grant Blume, Elizabeth Meza, Ling Yeh, and Lia Wetzstein gave at the 2019 AERA Annual Meeting. The session participants were engaged and asked insightful questions – even at the sessions which took place at 8 a.m. on a Sunday! Visit the AERA website to learn more about this year’s theme, Leverage Education Research in a Post-Truth Era: Multimodal Narratives to Democratize Evidence, and the topics discussed at the conference. CCRI director Debra Bragg presented with colleagues Pamela Eddy and Yi Hao from College of William & Mary about their recent NSF-funded project, Supporting and Advancing Geoscience Education in Two-year Colleges (SAGE 2YC). The four-year project implements a professional development model that prepares two-year college (2YC) geoscience faculty to be change agents on multiple levels, starting with their own practice and extending to their campuses and regions. Changes that faculty seek to improve in student success include broadening participation, increasing attainment, and ensuring pathways progression (transfer and employment). Three years of findings will be discussed, including how existing theories on organizational change, change leadership, and transformative leadership both inform and fall short of explaining 2YC faculty change agent roles. Lessons for 2YC professional development will also be discussed. CCRI researchers Elizabeth Meza, Grant Blume and Debra Bragg will presented a recent study completed as part of the high-performing transfer partnerships (HPTP) project. Extant postsecondary transfer scholarship fails to acknowledge that the community college and the four-year university in tandem share responsibility for transfer student outcomes. A paucity of research examines these postsecondary organizations as institutional pairs and aside from recent work by Xu and colleagues (2018), no identification strategies exist to discern the positive (or negative) effect that institutional pairs may have on a transfer student’s educational outcomes. In this study, the researchers leverage extensive administrative data and multilevel modeling to conceptualize transfer students as nested within institutional pairs. With a focus on racial equity, they add to the emerging scholarship and policy research that acknowledges the importance of community colleges and four-year universities as partners in the postsecondary transfer process. To learn more about the methods and findings of this study, read HPTP Data Note 10 here. It is important to understand the factors that facilitate successful transfer and completion between two- and four-year colleges, as this is the path to baccalaureate attainment for many college students, and particularly historically underserved populations. CCRI researchers Ling Yeh and Lia Wetzstein presented a paper that draws upon qualitative data from a multi-state, mixed-methods study on high-performing transfer partnerships, defined as pairs of institutions that perform better than their peers in transfer, retention, and completion for all students, and particularly underrepresented students. The researchers shared findings about factors that promote and impede these successful cross-institutional partnerships. Their research aims to build upon previous conceptualizations of transfer partnerships by specifically examining institutional pairs that promote more equitable transfer outcomes for underserved student populations. To learn more about this study, read HPTP Data Note 8 here.